Ferdinand VII was the son of Carlos IV and Maria Luisa de Parma. Born in Madrid Oct 12th, 1785. He was the King of Spain from 1808 to 1833. The real (meaning: "royal", plural: reales) was a unit of currency in Spain for several centuries after the mid-14th century, but changed in value relative to other units introduced. In 1864, the real was replaced by a new Spanish escudo, then by the peseta in 1868, when a real came to mean a quarter of a peseta. The first real was introduced by King Pedro I of Castile in the mid 1300's at a value of 3 maravedíes. This rate of exchange increased until 1497, when the real, now issued in billon, was fixed at a value of 34 maravedíes. The famous "piece of eight" (peso de a ocho), also known as the Spanish dollar, was issued that same year as a trade coin. It later became widespread in America and Asia. In 1566, the gold escudo was introduced, worth 16 silver reales. 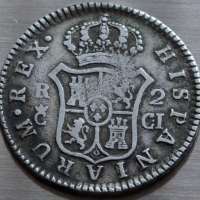 The "piece of eight" was so-called because the denomination was divided into eight silver reales (8 reales = 1 silver peso). 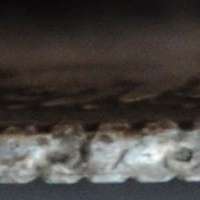 In addition to the "piece of eight," which was a one-ounce silver coin, other coins based on it were issued: 4 reales, 2 reales, 1 real and the little (half-inch diameter) half real. 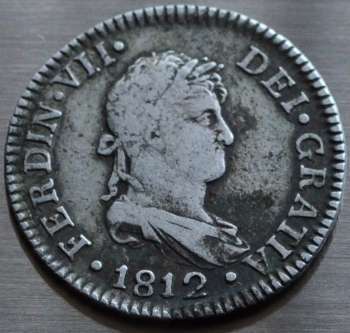 2 reales were known to be minted in Cádiz between 1810 and 1812 but no information about number of mintage. Crowned arms of Castille and Leon.